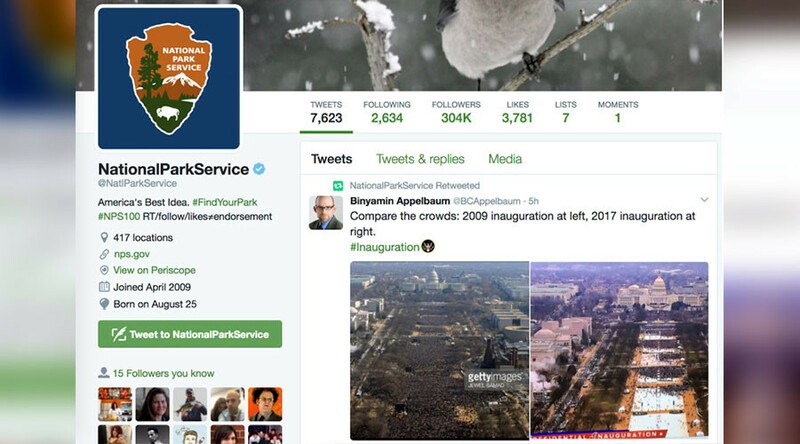 The National Park Service has said they regret the “mistaken retweets” that led to a blanket ban on tweeting from the Department of Interior’s Twitter accounts during Donald Trump’s inauguration on Friday. The two retweets in question addressed the apparent difference in crowd size between Barack Obama’s inauguration in 2009 and Trump’s in 2017 and the frenzy over the removal of particular policy areas from the White House website. READ MORE: Were ‘LGBT’ & ‘climate change’ really removed from Trump’s White House website? The retweets from the Park Service’s account led to the temporary shutdown of all the department’s Twitter accounts. “In summary, this Twitter stand down means we will cease use of Twitter immediately. However, there is no need to suspend or delete government accounts until directed,” the message reportedly said. In an apology tweet on Saturday, the National Park Service described the retweets as “mistaken.” The errant tweets were subsequently deleted. Inauguration crowd size was still a major news topic on Saturday, as new White House Press Secretary Sean Spicer, refuted claims of low inauguration attendance, claiming Friday's ceremony was the largest inauguration crowd ever. Numerous journalists took to Twitter to debunk Spicer’s claim. The new White House Press Secretary, Sean Spicer, actually just lied...like totally + blatantly about yesterday's inauguration. straight up.